In the paper, 31 experts, including a number of CPC faculty affiliates, argue that current international assistance for children in developing countries focuses too much on single categories of vulnerability rather than young children’s holistic well-being. The co-authors note that without a proactive effort to integrate programs for young children, harmonize implementation, and synchronize the measurement of results, program and outcome siloes are created, and an important opportunity to maximize results for children is lost. Young children’s needs and risks are multidimensional. Tackling one issue at a time, divorced from a more complex reality, is ultimately a disservice to time- and resource-strapped vulnerable families. Young children require integrated support, including health, nutrition, education, care, and protection. The science explains why. By turning attention and resources toward coordinated investments and delivery platforms, it is possible to close the gap between what is known and what is done to support young children globally. The paper is a call to action, informed by science from multiple disciplines. We hope it will help to close the gap between what is known and what is done to support the development of children globally and, in turn, sustainable progress for communities and nations. The paper was facilitated by the CPC Learning Network at Columbia University, and we are proud to have been involved. 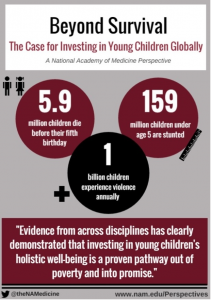 The initial concept paper resonated with members of the National Academy of Medicine’s Forum on Investing in Young Children Globally. The result is a discussion paper written and endorsed by leading academics and thought leaders from multiple disciplines – a joint statement for policy change.